Posted by Karen at 8:00 p.m. I had a Chrissy doll! Oh, I loved her so much, she was one of the best presents I ever got. My sister had the same doll only with dark brown hair, I don't remember that doll's name though. 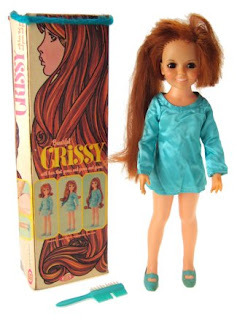 I had this model Crissy doll (with the turquoise dress) - my sister had the version with the orange lace dress. We begged our mother for a year non-stop for those dolls!